Chef Jason Reynolds is an award winning culinarian working for Ball State University Dining. He has been a member of the ACF, East Central Indiana, since 1993. 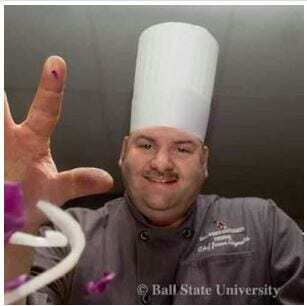 Chef Jason Reynolds is an award winning culinarian working for Ball State University Dining. Jason has earned gold and silver medals in American Culinary Federation (ACF) sanctioned competitions, has served on the national committee for NACUFS (National Association of College and University Food Services) Culinary Challenge, has attended numerous ACF and NACUFS regional and national conferences, and has competed in several culinary events. He has been a member of the ACF, East Central Indiana, since 1993. In 1994, Chef Reynolds, a native of Muncie, Indiana, graduated from Vincennes University with an associate degree in culinary arts. After graduation, Chef Reynolds worked for the Radisson Hotel in Indianapolis and at Woodland Country Club in Carmel, Indiana. In 1998, after traveling to western France on a Culinary Educational Tour, he joined the Ball State University Dining staff.As a chef for Ball State, Chef Reynolds supervises production, conducts departmental training, and performs display-cooking programs in SC Tally and for Cooking Live! Chef Reynolds, along with his wife, owns a catering business, Heavenly Creations Catering, since 2002. They create buffets and stations that are attractive along with excellent flavors of food. He has taught for Ivy Tech Community College in the Culinary Arts department since 2007. He enjoys teaching and giving back his knowledge of Meat & Seafood Fabrication to the students. Mainly concentrating on “flavor profiling”, I love to cook “seasonal” flavors and ingredients. 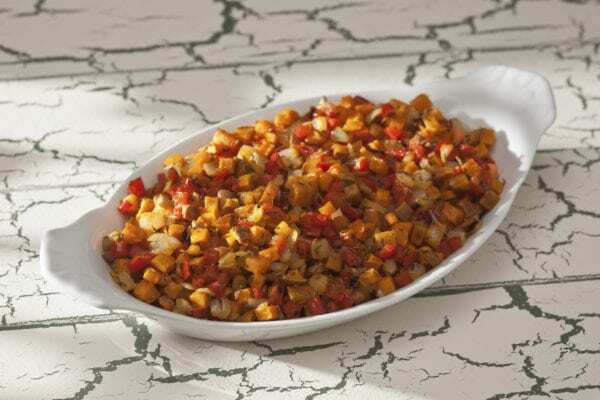 Right now what influence my fall and winter menu are fall favorites; pumpkins, sweet potatoes and pork dishes accented with nuts. Basically from chefs’ that I worked with from previous years that has had a strong influence on my cooking. Their influence combined with my evolution of experience is shown in how I design my plates and menus. I do a lot of research on the internet as far as seasonal item, and what the current trends are. Right now fruits with meat, chutney’s are coming back around big time. Flavored balsamic glazes for example have a strong influence in many meals I prepare. I create an apricot balsamic glaze that works wonderful with hearty meats. I like working with barbecues with an accompaniment of an apricot mustard or Citrus brined chicken breast top with peach mustard to produce a sweet and tangy sensation. I love savory fruits to create sauces that take the recipe to a higher level. How do you incorporate the sustainability movement into your menu offerings? Describe briefly about your recipe selection, favorite part, why did you select it? Some of my favorite special recipes come from my grandmother on my mom’s side of the family. She was a cook in elementary school and most of the cooking at that time was done from scratch. “Going to my grandmother’s house for the holidays was a real treat.” In fact even my mom and her three brothers cook too along with Dad’s side of the family; all had a love and passion for cooking. During my younger years this influenced me and grew my love for cooking, I am the only professional chef in our family. I attended culinary school 21 years ago and my first job was in a kitchen at a hotel in Indianapolis. After that I continued my career in the cooking field and worked in a country club where they did a lot of “flavor profiling.” I got the experience of learning more about the flow of food. When you take a bite of something you eat it together not separately and there should have an explosion of flavor in your mouth. I was lucky to have mentors along the way who pushed me to find my unique identity as a chef. The part I love the most is the chance to teach the students. I have a passion for cooking and am able to utilize our chef station and prepare meals in front of the students’ every day from 11-1:30 and prepare a different dish. I love the camaraderie of being seen front and center and having the opportunity to educate students on the health and nutritional aspect of the food they eat. Educating the community and students’ on what food is and how to make it healthy and delicious brings me a great deal of satisfaction. One by one I create a unique dish for each student that is not repeated in one semester. Wednesday is our Cultural Exchange Day for our International Program where we prepare a unique dish from whatever country they are studying that week. This week we are preparing a dish from Cameroon, West Africa, a national dish of bitter leaf stew made with Kale and beef stew meat along with peanut paste served in a bowl topped with sautéed shrimp and Fu fu corn which is a staple food in Africa and the Caribbean. This exposes the students to new flavors and explores other cultures. On Friday’s I serve a “specialty Pizza or Mac & Cheese recipe. I incorporate proteins or ingredients that have not been used from the week; for example Moroccan lamb pizza or Asian inspired duck macaroni and cheese. I am inspired to create entrees that you can’t find locally. What are your specialties as a chef? What is one of the best meals you have eaten or your favorite restaurant? My favorite things to eat are duck or rib eye steak. When I go out I tend to dine on either of these two items and really appreciate the many unique ways chefs prepare these meats. 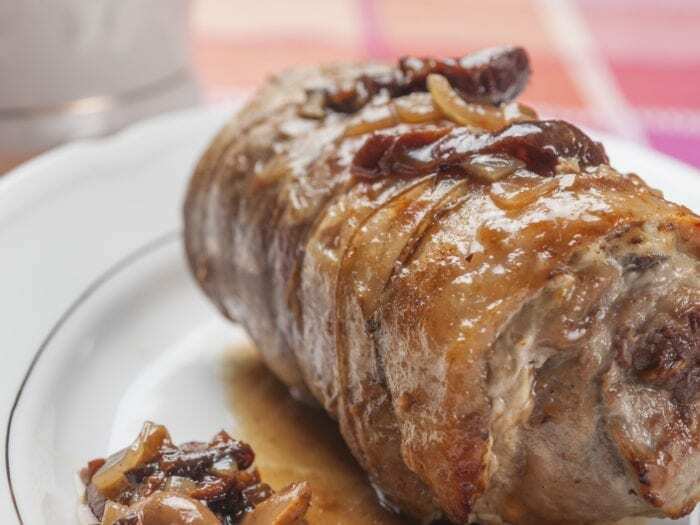 Apple Cider Brined Pork Loin I love the camaraderie of being seen front and center and having the opportunity to educate students on the health and nutritional aspect of the food they eat. Educating the community and students’ on what food is and how to make it healthy and delicious brings me a great deal of satisfaction.